Join Mayo Clinic Center for Innovation at Transform, a catalyst for engaging people to boldly create a sustainable future for health. Explore how the Center for Innovation uses design thinking to transform the experience and delivery of health and health care. Catch a glimpse of how we apply human-centered design to health care. We start with big ideas around people’s needs, frame them as opportunities, define and refine the concept and move fast to validate tangible models that can be scaled. The Center for Innovation’s role is to transform the experience and delivery of health and health care with a patient-centered focus. It offers a multidisciplinary team to turn innovative ideas for medical practice into practical solutions that change how patients receive health care — a medical transformation. Today, business evolves at a rapid pace. Innovation is more critical than ever, and health care is no exception. During the past 60 years, there have been significant advances in medicine. There is clearly an opportunity to do more — and Mayo Clinic’s Center for Innovation is doing it. Mayo Clinic takes innovation out of the clinic, on the road and into other medical practices and learning environments. 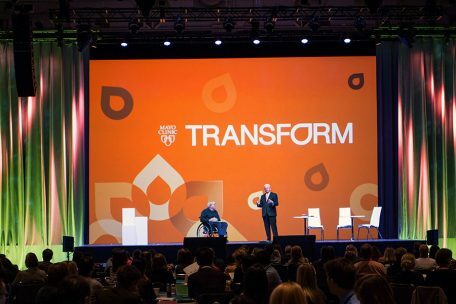 Transform is the annual conference, hosted by Mayo Clinic, for people dedicated to boldly creating the future of healthcare. Leading experts with diverse perspectives gather at Transform to accelerate health innovation by focusing on people.